Good afternoon, my dear crypto-enthusiasts, and today I want to tell you about the wonderful and promising SESSIA and its advantages. Sessia is a new social media application that has many advantages, especially for business people. The Sessia platform utilizes opportunities where the majority of people spend most of their time accessing social media. Social media is considered an appropriate and very strategic location for businesses to promote the products and services they provide. Social media is also considered to be very economical in creating advertisements because there is no need to spend a large amount of money even free. Today, business people tend to direct their business to be published through social media because of these benefits. They do not need to spend a lot of money to advertise their products and of course they have a longer duration. Through social media, each user can access and view the products being traded. To order, the process is also not difficult and fast. This is a special concern for the Sessia platform to create its own social media focused on its use in the business scope with additional supporting facilities. Users can easily access Sessia and browse every product they provide. Many types of products can be obtained through this platform. The purchase transaction process can also be done easily. Besides buying, users can also trade their products through Sessia. because Sessia is a digital business platform, so every user who has a business and business can promote it here for free. Promotional costs can be saved for other uses and of course the products sold have an affordable price. Blockchain technology implemented by this platform will support the protection of all types of data, both from consumers and sellers. These data will be stored securely on the blockchain system and will not be changed or falsified. Sessia has key features such as smart wall, geo search, user rating system, chat, and stores with payment gateway. All of them have their respective advantages that strengthen the Sessia service system. The technology underlying this project was not chosen by chance, because the blockchain is our bright future. Because with it you can easily keep track of all current processes. It allows you to control the security and transparency of all transactions, as well as be publicly available at the same time anywhere in the world. It is convenient, practical, and most importantly affordable. Analyzing its advantages, the development team decided why not use all these qualities in the retail market, while excluding all third parties that used to be a link between the brands “entrepreneurs” and their customers. So the idea of SESSIA was born. By eliminating intermediaries, SESSIA allows consumers to interact directly with any retail stores, both online and offline, regardless of their geographic location, through its platform. 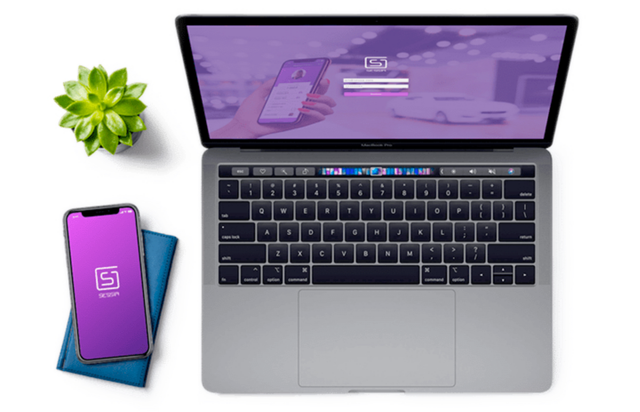 Brands will be able to encourage their customers personally for each purchase, charging them a small cashback automatically. Why cash back? Oddly enough in recent years, this word has become too popular in social society, and all because this model of interaction between the seller and the buyer as much as possible stimulates to buy exactly the product that allows you to receive in return some additional value, that is, cashback. But this is not the only good news, which is the system SESSIA. 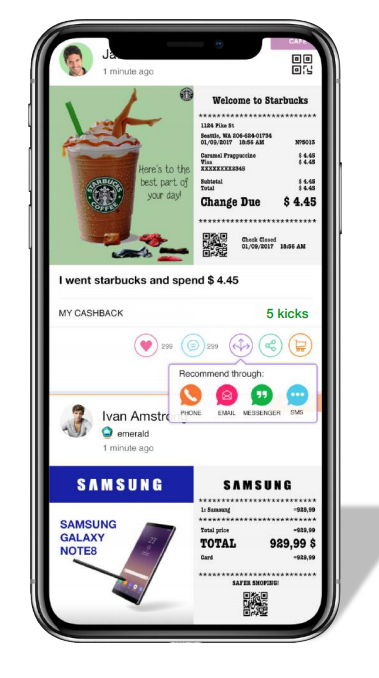 Entrepreneurs will also be able to directly encourage their customers with additional “kick” (this is an internal token of the SESSIA platform) for the fact that they bring their friends and they also make a purchase in a particular store. In fact, bring a friend get another nice bonus. This scheme is very similar to word of mouth, and as we know it is one of the most powerful tools existing in trade and market relations. The advantages of the SESSIA platform over other decentralized projects is that SESSIA simply creates an environment for communication between both parties, without taking an active part and without charging large fees. It is a pleasure to work with SESSIA, because in its Arsenal there is a huge number of tools, both for entrepreneurs and for buyers. _Entrepreneur: gets access to all the functions that contribute to the configuration of their systems of incentives, where each sets their own minimum and Maxim, are available to absolutely everyone. In order to consolidate the information I propose to consider a small example of user interaction and for example some coffee using SESSIA system. You decide to buy coffee, pay for it and get your goods, as well as a check which contains a special code. The seller scans this code through SESSIA, after which the system identifies the client’s ID and publishes in his social network the completed purchase, the accrued cashback, as well as the Commission profit obtained as a result of the recommendation to his friends. Everything works very quickly, and most importantly efficiently and without any hitches. Because of Sessia’s focus on business development, this platform can support digital store creation. every business platform will get their own digital store and can freely use it to trade their products. This digital shop concept is like an online store and can be accessed easily via the Sessia mobile app. to join the Sessia network is not difficult. For businesses who want to start participating in this platform, simply register the platform first by completing some data related to the business platforms they manage. 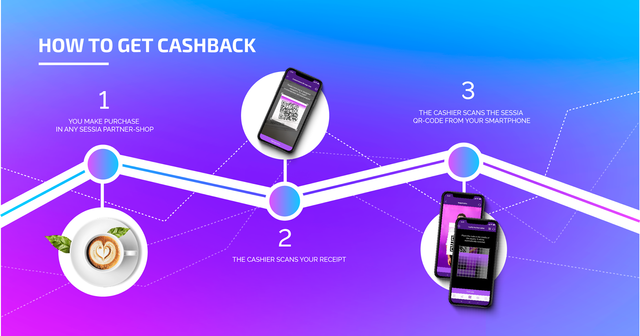 Sessia supports loyalty programs by providing cashback and kickback to users so that this can attract other new users to join this network. Cashback and kickback can be obtained for every shopping transaction made. Sessia system will serve purchase transactions in a short time even less than one minute. 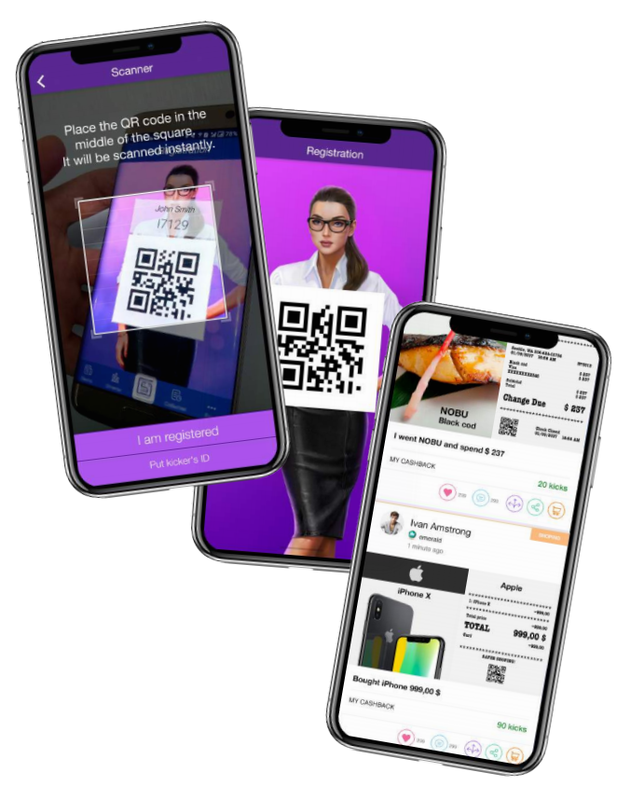 For users who want to buy a product, they simply scan the barcode displayed with the product and then process the transaction after being confirmed by the user. In just three quick steps, users will then get the products they buy as soon as possible. This very easy process will also be more interesting with the acquisition of cashback and kickback. In addition, users can connect directly with business owners through social media features such as chatting. If users find things that are confusing or have further questions about a product, they can send messages directly to the business owner and will be responded to immediately. This messaging system is like we chat through social media because it is also equipped with emoji and sticker features. In addition, this social media concept is also displayed through posts that can be seen on the homepage. The post will contain information about the product purchased by each user while displaying proof of payment. This post will automatically be displayed after the user completes the payment transaction. As I said earlier, there will be an internal token inside the system, which has a very interesting name – KIKCs. This token has THE standard ERC20 coins developed on the basis of the Ethereum blockchain. The choice in the direction of the Ethereum network was not made by chance. Since this network has a number of advantages that can ensure the safety and reliability of the development of this project, as well as contribute to high liquidity and predictability of the development of the entire project. A total of 100 million coins will be issued from them all unsold KIKCs during the ICO will be burned, as each of these coins is backed by a smart contract. The presence of a smart contract provides a guaranteed payment of all cashbacks and other Commission charges to absolutely every member of the SESSIA system, regardless of which country in the world the purchase was made. The SESSIA project represents an ideal trade relationship between entrepreneurs (brands) and their customers (buyers). After all, all that is necessary for entrepreneurs is that their goods were in demand and bought more and more. And all that is needed is to encourage customers for their choice and a sense of benefit that it can bring to their families and friends, recommending in their social networks one or another favorite product. The very concept of SESSIA is very interesting to me, so I decided to write this review. However, do not forget that my review is for informational purposes only and does not call you to any action. Nevertheless, I recommend that you personally study this project in more detail. To do this, at the bottom of the article are available all the necessary official resources SESSIA, where you can find everything you need.